Impaired drivers on Ohio’s roadways have more than a Breathalyzer to worry about, now that law-enforcement officers are being trained as drug detectors. Dozens of law-enforcement officers statewide have been certified as drug-recognition experts, trained to determine whether someone is impaired from drugs or a medical condition and to give an opinion on what type of drug — legal or illegal — might be causing the impairment. Even with a legal prescription, a person "can be under the influence and should not be driving a vehicle," said Assistant Franklin County Prosecutor Keith McGrath, who prosecutes vehicular crimes. Drug-recognition experts are relatively new to Ohio, the 48th state to add the program. Since 2010, 71 law-enforcement officers statewide have completed the rigorous training. Four of those officers are with Columbus police. The focus on holiday weekends, such as the Memorial Day weekend that starts today, is often on drunken driving, but law-enforcement officials say that the drug-recognition experts are one more tool that can be used to keep impaired drivers off the roads. Last year, experts performed 480 evaluations after stops on Ohio roadways. A drug-recognition expert’s opinion can be better than a urine or blood test because he or she can help determine what’s happening with the impaired person at that moment, said Sgt. Wes Stought of the State Highway Patrol, who coordinates the program. "Urine (or blood) is just an indication of what’s in the body, not what’s psychoactive in the body," he said. The drug experts have an 86 percent accuracy rate when their assessments are compared to the results of blood and urine tests, Stought said. Prosecutors and law-enforcement officers are thrilled with the program. But to defense attorneys, it’s "made-up stuff," said Tim Huey, immediate past president of the Ohio Association of Criminal Defense Lawyers. "It sounds scientific because it has these underlying medical processes to it, but no medical doctor would stand up for it," Huey said. The association holds a three-day DUI seminar every March, and this year’s focused on drug recognition. Huey wants defense lawyers specializing in impaired-driver cases to take the recognition experts seriously and avoid establishing a legal precedent. "Unless you do a good job of showing that it’s hocus pocus, then it could end up being accepted when it’s not scientifically accurate," Huey said. It will be up to the courts to decide whether a recognition expert is reliable or not. So far, only one officer has been accepted as an expert: a Cincinnati police officer in October. No case involving a recognition expert in Franklin County has reached trial, though some are in the pipeline, McGrath said. Evidence from a recognition expert might have convinced a North Side man to plead guilty last month and avoid trial in his vehicular-homicide case. William J. Hill had a blood-alcohol content below the legal limit to drive in Ohio, but officers still thought he was impaired when he ran a red light in his truck, killing a 5-year-old boy. A recognition expert made the call that Hill, who suffered with a brain injury and had been prescribed five psychiatric medications, was impaired by those legal drugs. Hill was sentenced to three years in prison. The symptoms and clues associated with drug impairment are different from those with drinking. "It’s a change in your mindset of how you’re approaching things and what you’re looking for," Stought said. 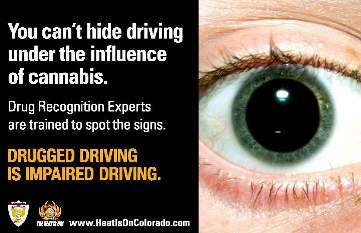 For example, while a drunken driver might slur his words and have slow reactions, a drug-impaired driver might be jittery and sweating. The expert’s evaluation, conducted at a police station, resembles a medical exam. The multi-step process includes conducting an interview, taking vital signs, measuring pupil size in a dark room, checking muscle tone and obtaining blood and urine samples. Recognition experts don’t try to identify the specific drug the driver is suspected of using but rather one of seven categories, like central-nervous-system depressants such as Xanax and Zoloft or narcotic analgesics such as OxyContin. Eight law-enforcement officers recently took part in nine days of training at the patrol academy in Columbus. The session, along with two others this year, was covered by a $180,000 federal grant. In June, the group will head to the Maricopa County jail in Arizona for the next phase of training: testing their new skills on impaired inmates. Teaching all patrol officers about drug-impaired drivers is key so they know when to call for a drug-recognition expert. More than 1,500 officers statewide have completed a two-day class on Advanced Roadside Impaired Driver Enforcement. "You have to educate the officers who aren’t DREs," Stought said. "It’s a learning experience for the whole state." McGrath, who was on the task force studying drug recognition before the program was started in Ohio, said defense attorneys can argue against the evidence, but recognition experts’ opinions help bolster cases such as Hill’s. "The drug-recognition expert’s report and his actions that day helped me as a prosecutor get evidence I otherwise would not have had," McGrath said. And that evidence, he added, "may have encouraged him to plead guilty."